I also tried out a new accent nail trend that I have been seeing on Tumblr a bit lately: using the pointer and middle fingers. I am actually liking it a lot! My accent nails are Color Club Twiggie with Nail-venturous Floam gradiented on the tips. My other three nails are Color Club Puccilicious with Nail-venturous Pinkerbell. Of course, my camera hates purple, so Puccilicious looks much more blue than it is in real life (check out the iPhone pic at the end for slightly more accurate colors). 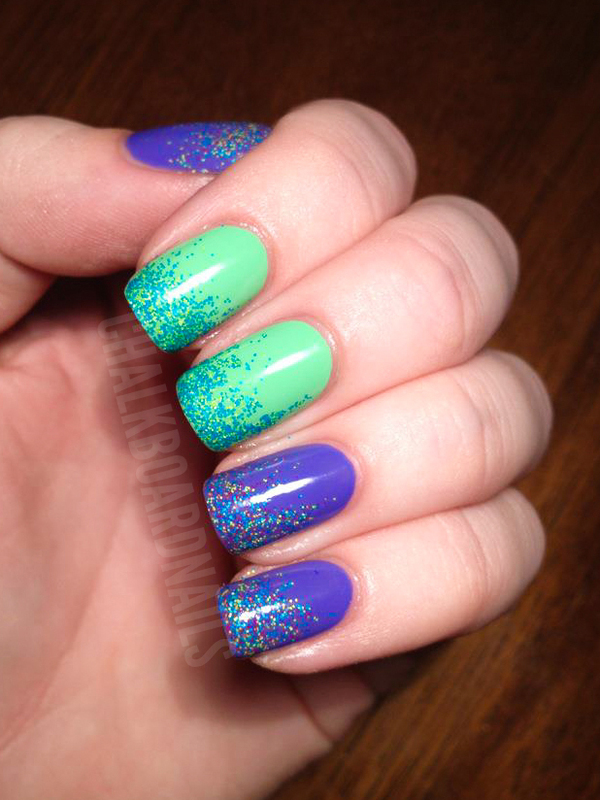 This gradient was pretty simple, I just put some of the glitter on my brush and painted backwards. I then added a bit more to the tips for extra density, and voila! Done. Two coats of SV and I was good to go. Nail-venturous Lacquers are available on Etsy. Sign up for shop notifications or check Amy's Facebook page for more information on purchasing. This is phenomenal. Gorgeous as always! Beautiful! So funny that the iPhone camera can be more true to color than an actual camera - I find the same thing happens to me! Either way - blue or purple - it looks awesome. jklajdfoi;dakf;j Your swatches are the most AMAZING everrrrrr. This looks so pretty, I need to get Floam on my hands! It looks sooo beautiful! I love it! This is a lovely, lovely result - love it! I absolutely love this! Very cool... bet I could do a similar look with The Hungry Asian's 'Sneeze Breeze' as I think it's a similar glitter? Oh, wow, very nice, I like the accent nails. Not sure how I feel about those two as accent nails, but I love your stamping. So cool, I love it! 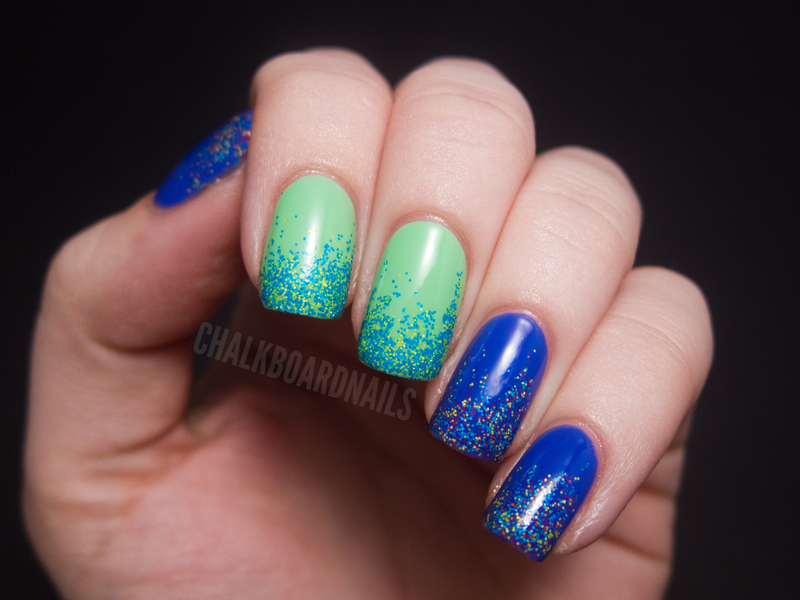 One of the most unique glitter gradients I've seen! wow! This looks absolutely gorgeous! What a gorgeous gorgeous mani! 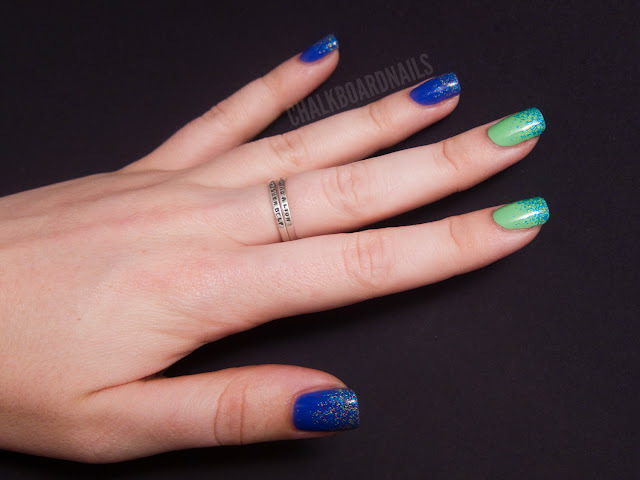 This is really cool- I love how the glitter gradient turned out! It's funny, but I've never thought of simply applying the glitter backwards to get a more even gradient, and being able to keep more glitter at the tips. Thanks! I love this. Floam and Pinkerbell are so perfectly awesome. OMG A FLOAM GRADIENT SO PERFECT I LOVE THEM! this is a perfect way to wear these glitters! so jealous, i need them! Floam gradient rocks. Love it!! So pretty! I love it! Floam is so amazing! Nicely done! Love the colour of the green. Looks like pixels. I love it! A lot of cameras seem to hate purples :/ Pretty mani! This mani looks amazing, I love it so much! Wow, awesome combo and gradient! This is one of the most fantastic manicures I've ever seen, for real. I love both Color Club polishes you used and the gradients are perfection. It looks wonderful with your skin! Aaaahhh, Those look awesome. But. If it's a "new accent nail trend that [you] have been seeing on Tumblr a bit lately" ... That could be femme flagging. Just be prepared to get odd questions, I guess.